Matzo ball soup from Jan’s Coffee Shop in Los Angeles. My street cred when it comes to matzo ball soup is shaky at best: I don’t have a bubbie, and truth be told, I can’t make a (good) matzo ball to save my life. As a chef, I’m disappointed to admit this shortcoming in my repertoire. But then again, there are lots of things I can’t cook well, like hollandaise, or anything that requires culinary precision, like French macarons or tiny fancy cakes. Last week, in the middle of a July heat wave, I had a debilitating craving for matzo ball soup. This wasn’t just any kind of craving, like “I’m craving chocolate, so any version of chocolate – cookie, ice cream, cake, chocolate chips if we have them – will do.” This was a craving that hit deep in my gut, one that went beyond filling my belly with a warm bowl of soup. To me, a bowl of matzo ball soup is the dietary version of a hug. It’s comforting in the way the aroma floats up into your nose, caressing it with savory promises. I love that first spoonful of broth and the way that you can feel it warming up your body from the inside out, coating your tummy with goodness that restores the life to your soul. I love the way the matzo yields to each bite, with strangely familiar flavor and spongy-soft texture. So while matzo ball soup wasn’t a part of my childhood experiences of family, love, or comfort, it has come to symbolize those familiar nurturing qualities for me as an adult. And right now, I’m craving comfort, love, and more than anything, I’m craving home. You may have noticed that I’ve been away from my blog for a while. I’ve been working on new projects and traveling…lots of traveling…which is wonderful until it’s not. Sometimes the best place to be is home, which is why I’m writing about matzo ball soup in the middle of July. I’m back at home in the bungalow, and craving my creature comforts more than the Roman pasta I dreamed about for years, enjoyed on a patio in the shadow of the Parthenon. I want to get back to my simple yogurt parfaits in lieu of flaky French croissants. Even the flakiest croissant I’ve ever had – and yes, it was truly remarkable and so so so good – can’t replace the comfort of making coffee in the morning for my husband while I gently whip up breakfast polenta and pour it into my favorite mug. I want to sleep in my own bed and I want to sit on my patio. These things aren’t particularly fancy or grand; our patio holds two small armchairs, a round table with plastic chairs, and is watched over by a lovely flowering tulip tree. That’s it, but it’s all ours, and I enjoy watching over my happy patio while washing dishes. I miss puttering in my kitchen, wandering my local farmers market, and chatting with my neighbors. Sometimes I prefer the simple comforts of home in lieu of a grand chateau, or the jaw-dropping Gaudi architecture of Barcelona, or even the serene shores of Lake Michigan. Sometimes home is the only place I want to be. The other night, I walked to our corner diner and ordered a matzo ball soup to go. I love that in a town of glitz like Los Angeles, where a hot new restaurant opens every day, this place feels like it hasn’t changed one thing in over 50 years. It feels like time forgot this corner of Beverly Boulevard, with its giant parking lot of free parking. There is no valet stand at Jan’s. There is a long bar with round stools reminiscent of a soda fountain, and deep, comforting booths. 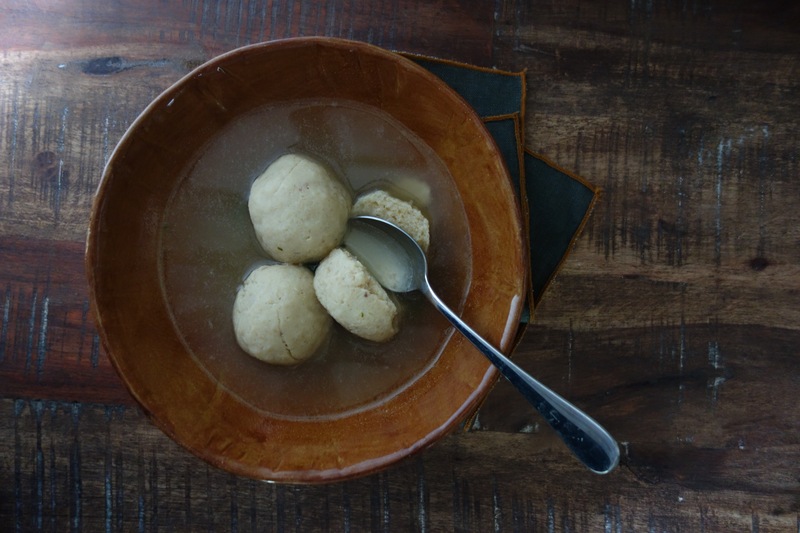 They make their matzo ball soup from scratch every day. I know this because when we walk our dog through the neighborhood in the morning, I can smell the onions that have gone into the pan to sweat down, awaiting the addition of carrots, celery, and other aromatics. They still make most things from scratch at Jan’s. And while it’s not particularly remarkable or fancy, sometimes that’s what I want over the latest and greatest, or the trip of a lifetime. I’m feeling grateful to be home, even if it’s short-lived. Soon we’ll set out for a new adventure, new places and dishes to taste and photos to take. We’ll be spending the rest of the summer in New York, among those tall, strong skyscrapers, feeling the energy of the streets and the sweltering heat of the deep summer. I will seek comfort in finding new routines, perhaps not matzo ball soup but something that will remind me of the comforts of home while we’re away. Until then, I’m going to savor this bowl and all of it’s steamy goodness…even if it is making me sweat in the middle of a heat wave. There’s nothing like home. I totally agree that there is something to appreciating every day. Traveling, new experiences, fabulous times are great, but there’s such comfort in the daily routine of home. Great post!